An ambitious project to build an iconic National Prayer Landmark in the UK took its next step forward yesterday with the unveiling of a shortlist of five concept designs at a parliamentary reception in London. The man behind the vision is former Leicester City Chaplain Richard Gamble, who carried a cross throughout Leicestershire 13 years ago. He told the invited audience “there is something powerful about representing the nature of God in a visual way”. In total, 134 entries from 24 countries were received and following two judging panels, the entries were whittled down to four, plus a public vote winner. Reception host the Rt Hon Stephen Timms MP, a member of the judging panel and Chair of the APPG for Faith and Society, and 100 invited guests heard about the vision of the project from Wall of Answered Prayer Director Richard Gamble in an interview with BBC World Service Business Presenter Sally Bundock. This was followed by Chair of the Judging Panel and architect Renato Benedetti unveiling the four winning designs, with the designers present at the event. The fifth shortlisted entry was selected by the public via an online vote on social media. The next stage of the project will be a National tour later in the Spring, working with Ibstock Brick. Once the Wall of Answered Prayer is built, it is estimated that this could be the size of 100 houses, which is three times the size of the Angels of North. The aim of the project is to see this iconic structure built by the side of a motorway. Locations currently being investigated are focusing on the Midlands (M1, M69, M42, M6). Cost is estimated at £6.25m plus funds for social housing and maintenance. The project is planned to include a visitor centre, 24-7 prayer room, an educational element and an “interactive experience” bringing the stories behind the answered prayers to life. Chair of trustees Alan McCormick, who runs Mission Direct, also spoke on how people could get involved in giving and praying for the project. “To be in Parliament this afternoon to unveil the five shortlisted concept designs is a great thrill, as this showcases the amazing talent of our finalists and brings together our friends and supporters, who have walked the journey since we launched our Kickstarter last year. "After 13 years of waiting, it's now exciting to see what the concept design of this National Prayer Landmark might be and the way in which the brief has been interpreted. I believe seeing something of the design will enable those who wish to contribute to the project what it could look like. 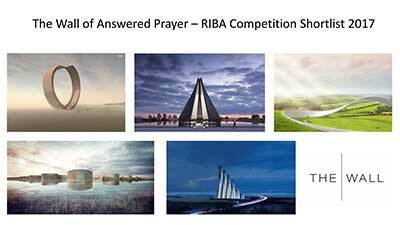 “I am delighted to sponsor the Reception in Parliament to unveil the shortlisted designs – as submitted to the global competition – for the Wall of Answered Prayer. "As judges, meeting at the Royal Institute of British Architects last November, we had a tough job whittling down the entries. I am particularly pleased to welcome finalists from Denmark and Italy, as well as from the UK. Find out more at http://thewall.org.uk/.